SAN FRANCISCO--(BUSINESS WIRE)--Wells Fargo & Company (NYSE:WFC) and NeighborWorks® America announced today that more than 3,900 homeowners were created in 2018 through the Wells Fargo NeighborhoodLIFT® program — bringing the total number of homeowners assisted to nearly 20,000 since LIFT programs were launched in 2012 in Los Angeles and Atlanta. 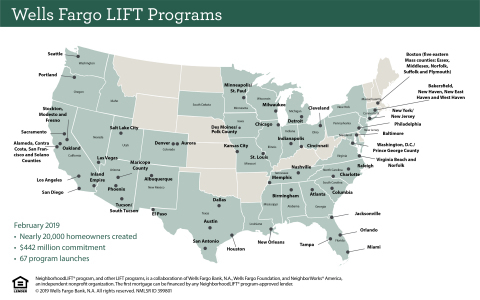 Wells Fargo has invested more than $442 million for 67 LIFT program launches in support of sustainable housing, making it the single largest corporate philanthropic effort of its kind in the company’s history. NeighborWorks America research indicates that in that time, LIFT homeowners have purchased more than $2 billion in real estate nationally. Sixty-one percent of LIFT homeowners represent low- and moderate-income households, defined as those earning 80 percent or less of the area’s median income. The program helps level the playing field for working families who might not otherwise be able to save up for a down payment. Among LIFT buyers surveyed, 42 percent pay less for housing than they did previously. Eighty percent of LIFT participants stated that the homebuyer education services they received will help them manage their finances and sustain homeownership. 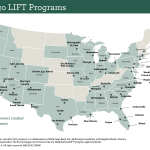 More than 60,000 potential homebuyers have received housing counseling from a NeighborWorks network member engaged in LIFT programs.